I have worked with a lot of speakers, and Devorah is a dream come true! She is responsive, meticulous, patient and above all else: an expert in her field. She made my life so much easier in planning a large and complex event. Her speech was relevant, thoughtfully researched and 100% relevant. Tons of our attendees approached me afterward to let me know how much they enjoyed it. Devorah Heitner’s parent talk was superb! Her talk was humorous, interactive, practical, and highly relevant to parents’ questions and concerns. We are looking forward to having Devorah back next year to potentially work with students and teachers. Highly recommended! Thank you so much for an amazing day and evening! We really appreciate you sharing your expertise and wisdom with our community. Our teachers, kids and families are still buzzing about your visit, and it will be a great jumping off point for going deeper in this work as a school. Devorah did an amazing job connecting with parents about raising digital natives. She had terrific ideas about how to set reasonable boundaries and weave technology into family life in healthy, thoughtful ways. Devorah can be a guide to all of us exploring this new frontier. Devorah’s message was invaluable and should be heard by parents everywhere. Based on our work with her, our teachers are more empowered in the classroom. We are already planning Devorah’s next visit. Everyone really enjoyed your talk. Your style and personality made it engaging, and your academic background coupled with being a mom makes you credible and accessible. Your presentation was informative for me both as a technology educator and as a parent! Devorah was a pleasure to work with from start to finish, and she was very positively received by our staff, parents and kids. Middle schoolers were raving about you the next day. Not an easy task! 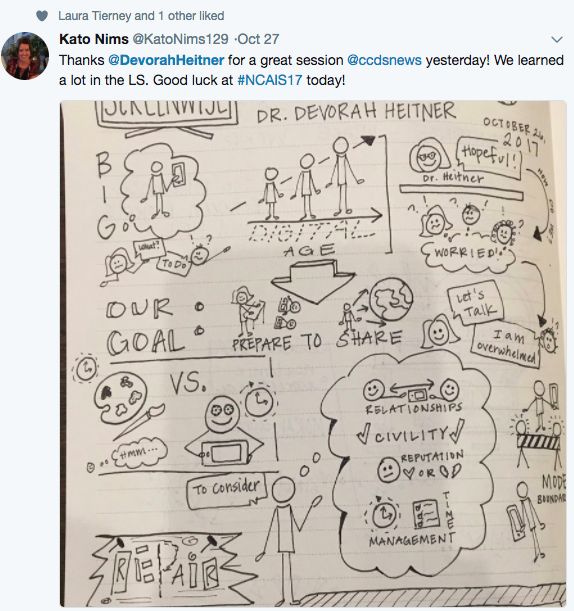 Our leadership team appreciated thoughtful feedback Devorah shared with us in our debriefing session. Devorah is so well-versed in the research, and moves effortlessly between a student perspective on the digital world, a parent’s perspective, and an educator’s point-of-view. Her facilitation style is engaging, interesting, relevant, and collaborative. Devorah’s approach to empowering teachers and parents to help their children develop digital judgment, maturity and wisdom, in age-appropriate ways, is not based on fear. She focused on building empathy, understanding and ultimately, positive identities. She illustrates clearly how technology exists in a developmental context for every human being, and how awareness of the context, thoughtfulness and transparency can harness the power of technology (including social media) to help children learn and grow. Devorah helps translate the digital world across generations in ways that honor children and adults, and that offers a vision for nurturing sound judgment and independence in students as they grow up in a global, digitized community. How can I book Devorah?